Four of a Kind — this entails four same cards. The suit can be different. Furthermore, the “high card” hand is the weakest from the above ten, whereas the strongest is the royal flush. 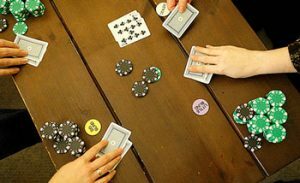 Now that we’ve explained poker hands, we’ll touch upon different poker games that might interest you. If we were to rank each and every game according to their popularity, this one would take the cake. Its name has become synonymous to real money poker games. And it’s not only available in poker rooms all over the world, but you can find it on some social media platforms as well. Furthermore, the game begins after the small and the big blinds are paid and once each participant gets two hole cards. Then the game has three rounds during the course of which five community cards take center stage in the middle of the table. The phases are known as the flop, the turn, and the river. Each of the phases is followed by a betting round where the players can opt to raise, bet, or call. At the end of the last round, showdown commences, and the person with the highest hand will get everything from the pot. This has become another popular poker game. Most often than not, the pot-limit variant is played. This version is extremely popular in Europe. Moreover, many compare Omaha to the aforementioned Texas Hold’em. But you’ll notice the difference from the very beginning. Namely, every participant receives four hole cards in the beginning. Also, the betting rounds and game phases are the same as those in Texas Hold’em. They too include the flop, the turn, and the river. And don’t forget — you must use two hole and three community cards to form your winning combination. A couple of decades ago, this was the go-to game in the USA. It is still a prominent form of poker, and most commonly, people decide to play it as a limit game. This means that all wagers are fixed. Additionally, it has elements which differentiate it from the above-mentioned games. Namely, players don’t flop here. We’ll mention the basic rules below. So community cards are not included. In simple terms, every player is dealt seven cards. Before the beginning, participants are required to place an ante in order to get three cards — two of which are face down and one is face up. After this, the person who has the weakest visible card needs to bring in. The game continues with players either folding, raising, or calling. Following this, the dealer hands out the fourth card, which is also revealed. And during this round, the participant with the strongest hand is the first to bet. Additionally, the same goes for the fifth and the sixth card. And lastly, the participants receive the final card face down and need to make a wager. Ultimately, the remaining players face off in a showdown and the strongest hand wins. The players then go against each other to decide who has better hands. During the game, a participant receives a point if their hand is stronger than the opponent’s. Many believe that this is the simplest poker game out there. However, you shouldn’t underestimate it — it’s still poker after all. The dealer ensures that every participant has five cards. After this, they place a bet. The players examine their cards and decide whether they want to discard any of them. And the maximum amount of cards they can discard is three. Of course, they’re replaced with new ones, which, hopefully, can increase the strength of their hand. In the end, participants engage in a showdown to see which one has the best card combination. To conclude, we’ve singled out five types of real money poker games. There are many more variants, but these are the most famous ones. 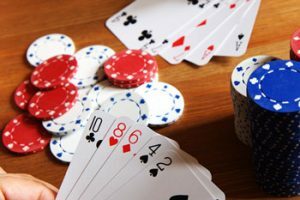 Although the article mentions the basic rules, keep in mind that, while playing poker, you need to be patient and remember that this is a game of skill. So what are you waiting for? Start practicing one of them now.